His Girl Friday (1940) is Howard Hawks' speedy and hysterically funny, modern-style screwball comedy, and one of the best examples of its kind in film history. Although it has an 92-minute running time, the breath-taking, fast-paced film has more than enough dialogue for a 3-hour movie. The film marked the beginning of a number of screwball comedies in the 1940s that emphasized the conflict for women in deciding between love/marriage and professional careers. The original film version of His Girl Friday was director Lewis Milestone's big hit The Front Page (1931), produced by Howard Hughes and released by United Artists. [Milestone had won the Best Picture and Best Director Academy Awards for the previous year's All Quiet on the Western Front (1930).] This second screen version's screenplay, again by Charles Lederer, brilliantly transformed Ben Hecht's and Charles MacArthur's newspaper classic - the George S. Kaufman-directed 1928 Broadway smash-hit play The Front Page, with a major script change. One of the main male characters in the earlier film, Hildebrand 'Hildy' Johnson (played by Pat O'Brien), became female - renamed Hildegard Johnson (played by Rosalind Russell), to star opposite the major actor, Cary Grant. 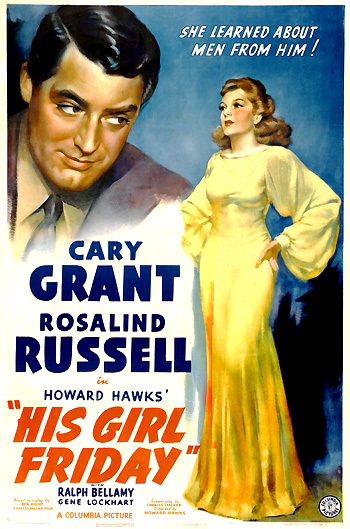 [Grant was the leading man from Hawks' two previous films: the male-dominated action film Only Angels Have Wings (1939), and the screwball comedy Bringing Up Baby (1938), and had appeared in other romantic comedies at the time (i.e., The Awful Truth (1937), The Philadelphia Story (1940), and My Favorite Wife (1940)).] Other changes in the script involved removing topical references to the 1920s, and jokes about Prohibition. The gender swap brought an entirely new angle to the film, making it more than a satirical view and social commentary on the operation of a newsroom under the management of a hard-boiled, smart-alec managing editor Walter Burns (Cary Grant in this version, Adolphe Menjou in the earlier film), and providing an additional feminine-romance angle. This madcap, giddy film - originally titled The Bigger They Are, is best remembered for its overlapping dialogue and simultaneous conversations, rapid-fire delivery, breakneck speed, word gags, sexual innuendo, plot twists, "in" jokes, mugging, jousting, sarcastic insults, frantic pace and farcical script. With its plot about a ruthless editor, a marriage renewed by divorce and the threat of re-marriage, a politically corrupt city, and a questionable judicial system, the romantic comedy is both a love story and a sophisticated battle of the sexes (and duel of wits). This screwball masterpiece lacked even a single Academy Award nomination. Cary Grant's un-nominated performance as the suave, calculating and exploitative managing editor, who attempts to lure and maneuver his ex-wife (and star reporter) back with the opportunity to write a breaking, front page news-story, is a tour de force of comedy - combining cartoonish faces, silent-film pantomime, slapstick, witty word-play, and irony into one remarkable characterization. Likewise, Rosalind Russell's role as the ace news-reporter to her ex-husband and ex-managing editor, who is wooed back from marrying a staid, dull, but devoted insurance salesman named Bruce Baldwin (Ralph Bellamy), is her greatest comedic portrayal, following her similar role in The Women (1939). "SHE LEARNED ABOUT MEN FROM HIM." Director Billy Wilder attempted a remake with a third film version: The Front Page (1974) with Jack Lemmon (as Hildy Johnson) and Walter Matthau (as Walter Burns). It was again remade (with the same gender twist, but newspapers were updated to a TV news environment) as Switching Channels (1988) by director Ted Kotcheff, with Burt Reynolds and Kathleen Turner in the lead roles, and a frosted-haired Christopher Reeve as the third individual in the love triangle, a New York millionaire. In the film's opening scene, a long traveling shot tracks from right to left within the newspaper offices of Chicago's Morning Post to display the working world of journalism. It moves past reporters typing, speaking on phones or writing at their desks. One editor calls out to a "copyboy," as the scene dissolves to a shot of female telephone operators at a switchboard in the outer office. As the camera moves further to the left, it rests on the elevators in the lobby. Hildy: (She pauses and walks backwards to him.) What did you say? Hildy: Go on. (He laughs sheepishly) Well, go ahead. Hildy turns and strides through the working offices from left to right. The camera tracks her movement as she extends hellos, a pat on the back, exchanges of information, and smiles to her co-workers. She enters the inner office of her ex-boss (and ex-husband), big-city newspaper editor Walter Burns (Cary Grant). In Walter's office are two of his buddies: gangster-type Diamond Louis (Abner Biberman) and managing city editor Duffy (Frank Orth). The latest news story, delivered by Duffy, is that the governor has refused to sign a reprieve for the execution of a mentally-disturbed murderer named Earl Williams (John Qualen). Burns has an idea that he wants Duffy to send to the governor: "Tell him if he'll reprieve Earl Williams, we'll support him for senator. Tell him the Morning Post will be behind him hook, line, and sinker." I'd know you anytime, anyplace, anywhere. A big fat lummox like you - hiring an airplane to write: 'Hildy, don't be hasty, remember my dimple.' Walter. It delayed our divorce twenty minutes while the judge went out to watch it. Walter: Look, Hildy, I only acted like any husband who didn't want to see his home broken up. Walter: What home? Don't you remember the home I promised you? Hildy: Sure I do. That was the one we were to have right after the honeymoon. Ha, ha, that honeymoon. Hildy: (shouting) Well, suppose we did. That isn't what I got married for! Oh Walter, you're wonderful - in a loathsome sort of way. Hildy (overlapping with his words, she pretends she is an auctioneer for Lucky Strike cigarettes): Sold American! Listen, Walter, the paper's gonna have to get along without me. So are you. It just didn't work out, Walter. You're losing your eye. You used to be able to pitch better than that. Walter: This is bigger than anything that ever happened to us. Don't do it for me, do it for the paper. Hildy: Walter, I want to show you something. It's here. It's a ring. Take a good look at it. Do you know what it is? It's an engagement ring. (He stops short for the first time.) I tried to tell you right away, but you would start reminiscing. I'm getting married, Walter, and I'm also getting as far away from the newspaper business as I can get. Walter: You're now talking about the man I'm marrying tomorrow. At last, Hildy is able to tell Walter what she originally came to say. She staunchly insists that she wants to be married - as soon as the following day - to a caring husband. When a flustered Walter learns that she plans to get married almost immediately ("Tomorrow? As soon as that? "), he rubs his hands together, fingers the phone, picks up a carnation from a vase, slips it into his buttonhole, and then rubs his lapel. During their farewell, Walter - who acts impassively - wishes her all the best, and then asks to meet Baldwin who is waiting outside - obviously, his mischievous mind is working overtime to find a way to dislodge Hildy from her imminent marriage: "Oh, now you're not afraid, are ya?...Come on, let's see this paragon. Is he as good as you say?" Walter bursts out of his office in front of Hildy (without holding the door for her as a "woman" but as a fellow "newspaperman") and firmly marches ahead of her through the paper's work area to confront Bruce. [The camera tracks their progress as they actually stride in step together from right to left across the screen.] In a comical case of mistaken identities, Walter greets an elderly gentleman in the waiting area ("I can see right away my wife picked out the right husband for herself"). Then after discovering his error, Walter shakes hands with Bruce's wooden umbrella handle instead of his hand. He cleverly humiliates Baldwin by suggesting he is a stuffy, older man, telling Hildy: "You led me to expect you were marrying a much older man...I realize you didn't mean old in years." Bruce is prepared for bad weather (with umbrella, raincoat, and rubbers): "A man ought to be prepared for any emergency," notes Walter. As Walter invites them both to lunch to find further ways to keep Hildy from marrying Bruce, Hildy warns him - from the side of her mouth: "You're wasting your time, Walter, it won't do you a bit of good." Walter: Certainly, why I wouldn't let her stay. She deserves all this happiness, Bruce. All the things I couldn't give her. Yeah, all she ever wanted was a home.